This lesson can be used as a pre-lesson for the Hey! What’s the Big Idea? lesson plan. found: the past tense of "find"
Students will be able to explain supporting details with adverbial phrases using a web graphic organizer. Ask students to share their knowledge of verbs by talking to a partner about what a verb is. Invite a few students to share their conversation and record their responses. Confirm the definition of a verb and provide more examples (e.g., "run," "walk," "smile," "create," "play"). 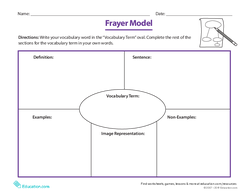 Ask students if they know what type of speech modifies, or describes verbs. Guide students to discover that adverbs are words that modify verbs. Tell your learners that today they will learn to identify adverbs and adverbial phrases which give us supporting details in nonfiction texts. Tell students that they will learn some new vocabulary words that will help them in the lesson. Project the vocabulary cards with definitions and images. Go over each one with students and clarify any issues that arise. 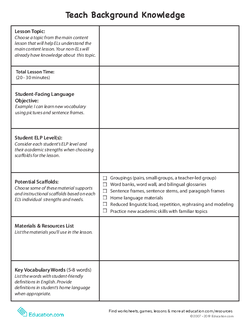 Distribute blank copies of the Glossary worksheet to students and instruct them to complete it with a partner, using the displayed vocabulary cards as a resource. 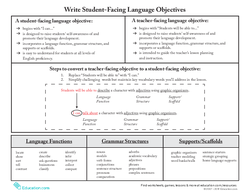 Tell students to draw their own images and write the definition in their own words. If applicable, have students use the last column to write the synonym in the home language (L1). Alternatively, they could write a synonym or antonym in English, using a thesaurus or dictionary. 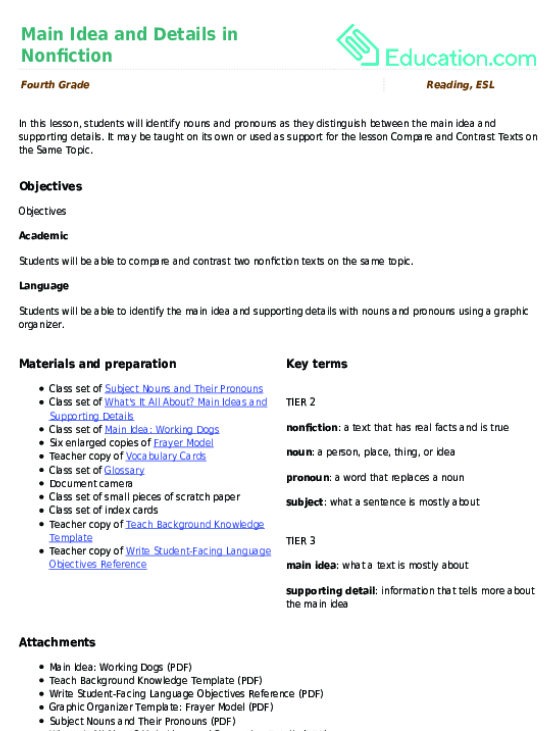 Review students' glossaries. Model how to use a few of the tier words in a sentence (e.g., "I vow to take you to the museum," or "The family immigrated to the United States."). Have students choose one word to use in a sentence and share it orally with their partner. Invite a few students to share their sentences with the class. 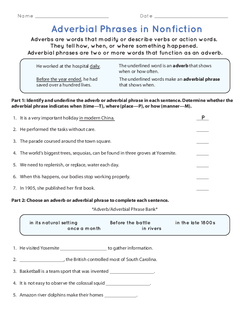 Project a copy of the Adverbial Phrases in Nonfiction worksheet and hand out one to each student. Read the teaching box aloud. 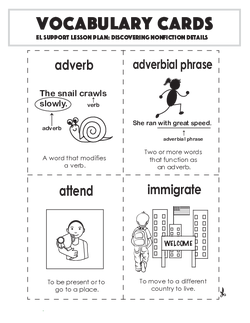 On a piece of chart paper, provide more examples of adverbs and adverbial phrases. Note: You could categorize the examples into the different purposes of adverbial phrases. Have a student read the directions of Part 1. Read and explain the first problem in the exercise. Assign students into partners and have them complete the rest of Part 1. Review answers as a class once everyone has finished. Direct students' attention to the second part of the worksheet. Read the adverbial phrases in the phrase bank. Instruct students to write on their whiteboards which type of adverbial phrase it is (T for time, P for place, and M for manner). Have them hold up their whiteboards to show their catergorizations of each phrase. Have students complete Part 2 of this worksheet with their partner. Hand out the Discovering Details worksheet to students and project a copy for students to see. Have students read the teaching box aloud to a partner. Read the nonfiction text aloud, and ask students to read it a second time silently to themselves. Instruct students to highlight the adverbial phrases independently before checking their answers with a partner. Tell students to determine whether the adverbial phrase is showing time (T), place (P), or manner (M) verbally with a partner. Ask students to share their categorizations as a whole class. For the formative assessment, provide a partially completed graphic organizer for students to complete. Have beginning ELs complete the individual work with a partner. Allow advanced ELs to use home language resources, such as bilingual dictionaries and online translators. Have advanced ELs demonstrate their learning by teaching small groups of intermediate or beginner ELs. 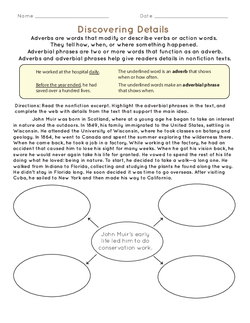 Ask students to review their highlighted adverbial phrases from the nonfiction text and use them to fill out the graphic organizer at the bottom of the worksheet. 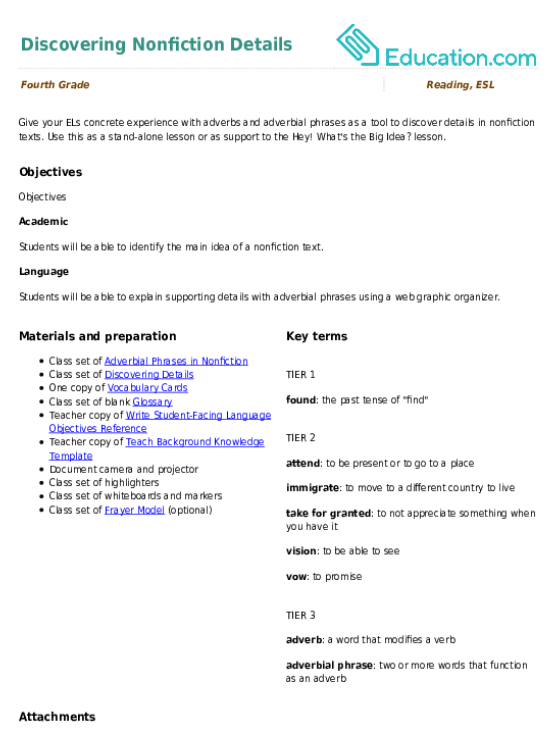 Read aloud and emphasize the main idea in the middle of the web, and ensure that students use information from the text that supports the main idea. Tell students that they are searching for details in the text. Form small groups of four students, and have each student read one of the "bubbles" they completed on the graphic organizer aloud to their group. Have students give a self-assessment of their understanding of the lesson's objective by holding up their hands. Refer students to the language objective and instruct them to show you on their hands, from one (meaning minimal understanding) to five (signifying solid understanding), how well they feel they grasped the lesson's objective. Help your ELs familiarize themselves with prepositional phrases as they search for supporting details in nonfiction texts. 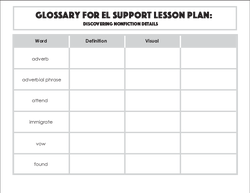 Use this glossary with the EL Support Lesson: Prepositional Phrases as Key Details.